First thing: Tater tots are always a great kicker to a meal. I know people will battle to the death over what the best potato side dish is. I’m not here to fan flames of wars. All potato options are great. But there’s something about tater tots that just make you a kid again. If you can’t get down with that, I can’t help you. Second, I find it interesting that the people at Delaware North consider this a Canadian delicacy. It is obviously here for the series with the Blue Jays, so I guess donuts on cheeseburgers is Canadian? I mean, I would think that something like this would be uniquely American, and thus invented here in the states. But then again, we thought that about baseball too. And that might have been invented in Canada too. So you can’t assume anything. But that’s another conversation. 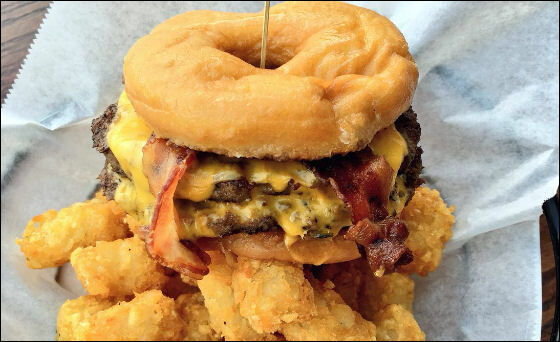 You should head to Cleveland this weekend for this burger and those tater tots.